A PENTHOUSE LOCATION BEYOND COMPARE, WAKE UP EVERY MORNING TO GULF AND LIDO BEACH VIEWS FROM EVERY BEDROOM! 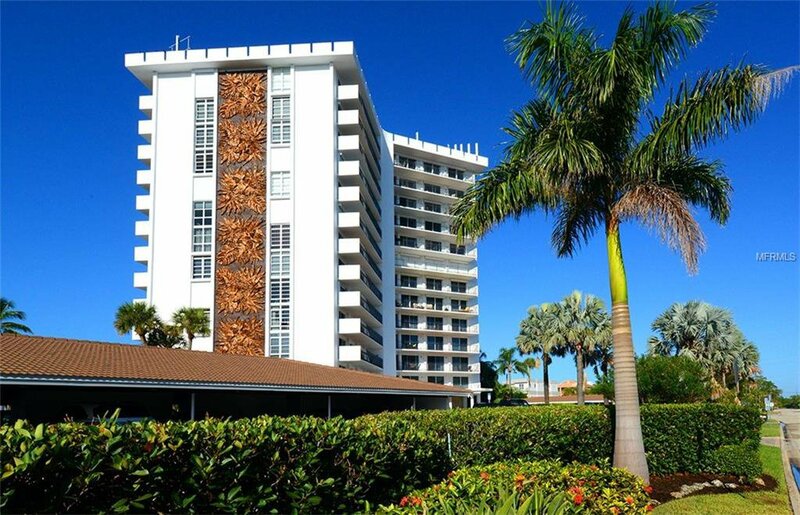 Only steps away from St Armands Circle, this two-bedroom, two-bath condominium, with 9’ ceilings at St Armand Towers North exemplifies Sarasota-living. Light and bright, the residence is poised to overlook endless water views, including the waterways of the Key. Relax in the spacious living room and open the sliding glass doors for refreshing sea breezes. Retreat to the master bedroom where the radius of island and Gulf views are ever changing as the sun makes its way across the sky. Step out onto the elongated terrace from both bedrooms. Floor to ceiling windows and sliding glass doors have been updated while electric hurricane shutters provide peace of mind. Additional items of note include: crown molding, wood-laminate floors, washer/dryer hook-up in place, oversized walk-in storage in the living room, and extra storage at your carport for beach umbrellas and chairs. The North Tower includes a fitness center, community pool, social room, assigned carports, and on-site management. Experience vibrant-hued sunsets from the sand or from your balcony, search for shells, picnic on the water, or take a short stroll from Lido beach to shop for shoes or take your pick of delicious restaurants and eateries found on the Circle. The cultural treasures of downtown Sarasota are just over the bridge. Listing courtesy of MICHAEL SAUNDERS & COMPANY. Selling Office: BRIGHT REALTY.